Relevance JIM3 was established from plasma myeloma cells derived from pleural fluid of an advanced multiple myeloma patient, and is homoplastic with the cell line JIM1. It allows in vitro study and comparison of genetic instability in myeloma tumour lines and in vitro study of the effects of DNA repair deficiency in myeloma tumour lines. JIM3 shows typical plasma cell phenotype (CD38, PCA-1 8A and CD24 positive), deficient in DNA repair. 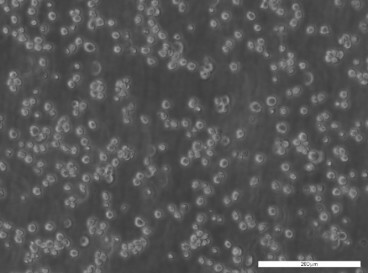 Production Details Derived from plasma myeloma cells from pleural fluid of advanced multiple myeloma female patient. Leone et al. 2008. Clin Cancer Res. 14(19):6033-41. PMID: 18829482. Deletions of CDKN2C in multiple myeloma: biological and clinical implications. Velangi et al. 2004. Carcinogenesis. 25(10):1795-803. PMID: 15142887. DNA mismatch repair pathway defects in the pathogenesis and evolution of myeloma. Hamilton et al. 1991. Leukemia. 5(9):768-71. PMID: 1943229. Normal and neoplastic human plasma cells express bcl-2 antigen.